If you are looking for wall hung glass shelves you have found the best online source! Glasstopsdirect glass shelf kits all feature 3/8” thick clear tempered glass with bright flat polished edges and touched corners. Tempered glass, sometimes called safety glass, is 4-5 times stronger than regular glass. If broken, tempered glass, crumbles into small cubicle pieces. This eliminates the danger of sharp edges. Shelf Kits are available in many sizes. Glass shelf depths include 4 ¾”, 6”, 8”, 10’, and 12” deep. 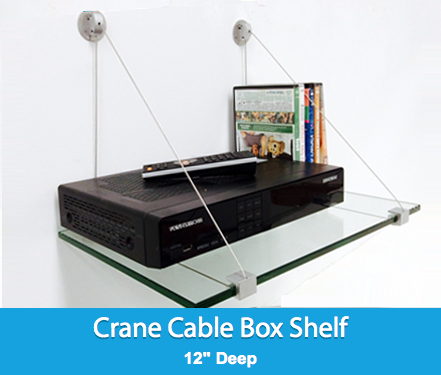 Glass shelf lengths include 12”, 14”, 18”, 21”, 24”, 27”, 30”, 33”, 36”, 42”, and 48” long. Many beautiful glass shelf brackets are available to choose from. Shelf brackets come in chrome, brushed steel, brass, black, and white finishes. Our shelf kits include the following shelf styles. Peacock glass shelf, Heron glass shelf, Monarch glass shelf, Cardinal glass shelf, Falcon glass shelf, Oriole glass shelf, Raven glass shelf, Crane glass shelf, Hawk glass shelf, Rail Overhang glass shelf, Kiwi glass shelf, Swan glass shelf. In addition, Glasstopsdirect, features an outstanding line of bent glass shelves. Including the Sparrow bent glass shelf available in 6”D x 18”L and 8”D x 31 ½”L sizes, the Kingbird bent glass shelf in 8”D x 31 ½”L, the Osprey bent glass shelf available in 6”D x 18”L and 8”D x 31 ½”L, and the Eagle bent glass shelf in 8”D x 31 ½”L. All four styles of bent glass shelves are made of ¼” thick heat bent clear glass. Bent glass shelves include (2) Peacock shelf brackets. Peacock shelf brackets are available in chrome, brushed steel, and brass finishes. Screws are included for installation on studs. With Free Shipping on Glass shelf kits and Bent glass shelves, now you can add charm and function to any room at affordable prices.